I generated a public/private key pair using PuTTYgen, and that works great. This allows me to establish an SFTP connection using WinSCP. Out of curiosity, I also tried getting the private key generated in cPanel at my hosting provider to work with WinSCP. I realize that cPanel does not create SSH keys in the .ppk format that WinSCP wants, so they must be converted using PuTTYgen. 1) What file extension should I save the private key from cPanel using? .pem? .txt? Does this even matter? 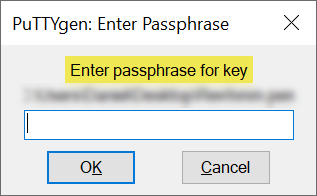 2) When I try to import my cPanel private key into PuTTYgen, why does it say, "Enter a passphrase for key"? Whatever I enter here, including leaving the "passphrase" field blank, is rejected when I try to import my private key from cPanel! There's no standard extension for PEM keys. And indeed, it does not matter. I do not know cPanel. ... There's "passphrase" field on the cPanel SSH Key Generator page.